What's More Valuable—Gold or Clean Water? In the Torah portion Vayeshev (Gen. 37-40) we encounter family violence and strife. The extreme dynamics of the text opens a window into the more ordinary dynamics that give rise to inadvertent strife. Unlike places where we encounter violence among peoples and nations, here we encounter violence that is closer to home. Jealousy, anger, misunderstanding, hurt are all inevitable realities of life lived with people. Tragically, strife is too often spawned by a lack of awareness of how one’s actions will affect others. The first word of the Torah portion, from which its name comes, sets the stage. Vayeshev, meaning “and he dwelled,” referring to Jacob, in another verbal form becomes va’y’yashev, meaning “and he made peace.” We can simply dwell, or, aware of our actions and their consequences, we can dwell more deeply, making peace in the place where we dwell. 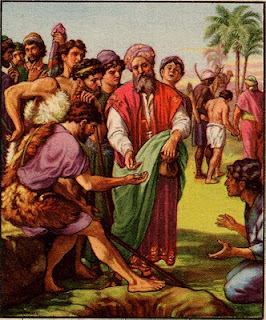 Showing favoritism to Joseph, Jacob sowed seeds of jealousy and discord between Joseph and his brothers. Simmering over time, unholy sparks of jealousy were fanned into flames of hatred and violence. Thrown into a pit and reported to his father as dead, Joseph is eventually sold into slavery and comes down into Egypt in chains. In a fascinating commentary in a volume of ethical teaching called Chochmat HaMatzpun/The Wisdom of Conscience, we are guided to look honestly at the lives of our ancestors and to learn from negative example as well as positive. Of the brothers’ behavior we are told, “it is a matter both ancient and new.” It is about our world, as well as theirs. Condemning their deed as “horrible, such a sin, such cruelty,” the writer then condemns Jacob for fostering such insensitivity in his sons through the favoritism of one. Helping us to see “the Torah of nonviolence,” the commentator bids us look beneath the surface and see a guide for living in the world beyond the text: A Torah of truth that does not whitewash the deeds of the great and beloved ones…, the Torah of life teaches us that we are to learn from our holy ancestors – even from their perversions and shortcomings. Engaging Torah as a guide for life lived with people, may we learn to make peace in all of the places where we dwell.